Hi-Fi Choice is the essential guide to getting the best possible sound from your hi-fi, whether you're buying, tuning or tweaking... It has a no-nonsense approach to reviewing the finest audio products available, from hi-res streaming and downloads to CD, vinyl and valves. 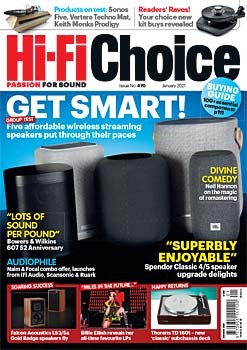 Hi-Fi Choice magazine has been at the forefront of audio equipment reviews and buying advice for 40 years and no other magazine has the same passion for sound that we do! From the first time I heard a ‘proper’ hi-fi I was hooked. It was the seventies and my grandad had purchased an entire demo system while visiting a London-based hi-fi show. I can’t recall the exact models that made up this amazing sounding hi-fi, but I can remember my awe, and my nan’s fury at his extravagant purchase. Her annoyance subsided as soon as she heard her favourite artists perform in her own living room, and I’m pretty sure she played more records than my grandad in the end. You see it’s the connection we feel when music is heard through a great-sounding system that’s so alluring, and you’ll find the same passion for sound in the pages of Hi-Fi Choice. The way we listen to music has changed considerably since my first hi-fi experience, with more ways to enjoy music than ever before. But no matter what audio device I choose, my desire for the highest quality sound is my goal. A passion for sound is the core ethos of the magazine and something Hi-Fi Choice likes to shout about.